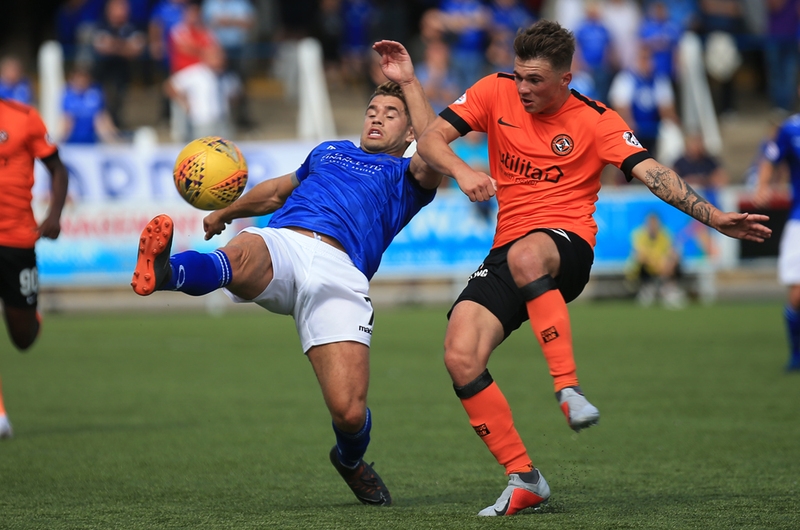 Two first half goals in the opening 27 minutes for visitors Dundee United proved to be decisive in today`s Championship clash at Palmerston as the men from Tannadice were able to hold off a spirited second half fightback from Queens to record their opening win of the season. The away side controlled most of the first half and had the games most influential player in Yannick Loemba, but after the interval it was a different story with Queens doing most of the attacking, and when they pulled a goal back midway through the half it looked as though they might claim a point, but ultimately they were unable to find an equaliser that their second half performance merited and they slipped to their first league defeat of the season. For the opening league game at Palmerston, Gary Naysmith named the same starting line up that collected a point at Cappielow as Queens looked for their first three points of the campaign. 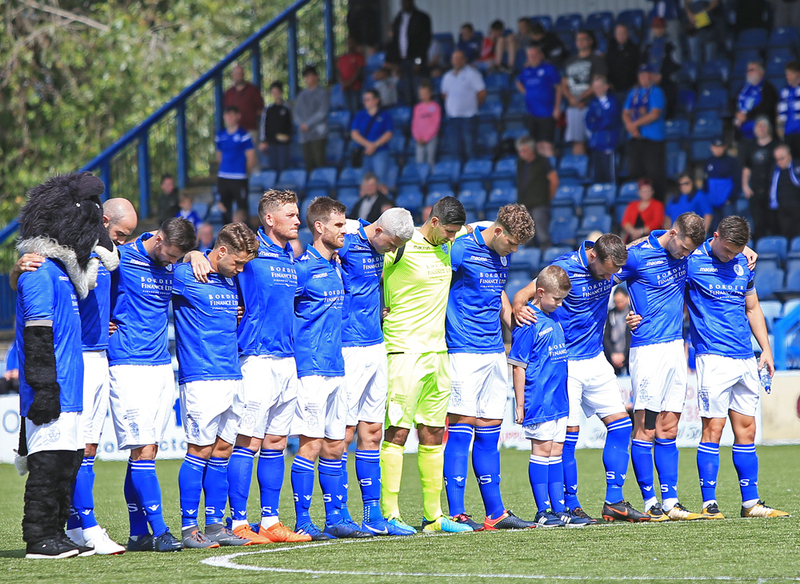 Before kick-off there was an impeccably observed minutes silence in respect of Queens legend Allan Ball who as we all know, sadly left us recently. Queens got the game underway in the Palmerston sun attacking the Terregles Street end but it was the visitors who had the games opening attack, winning a couple of quick corners, but both deliveries to the near post where comfortably defended by Queens. The early stages were mostly contested in midfield and on 8 minutes when Andrew Stirling benefited from getting the break of the ball, he had the games first effort on target shooting straight at `keeper Rakovan. 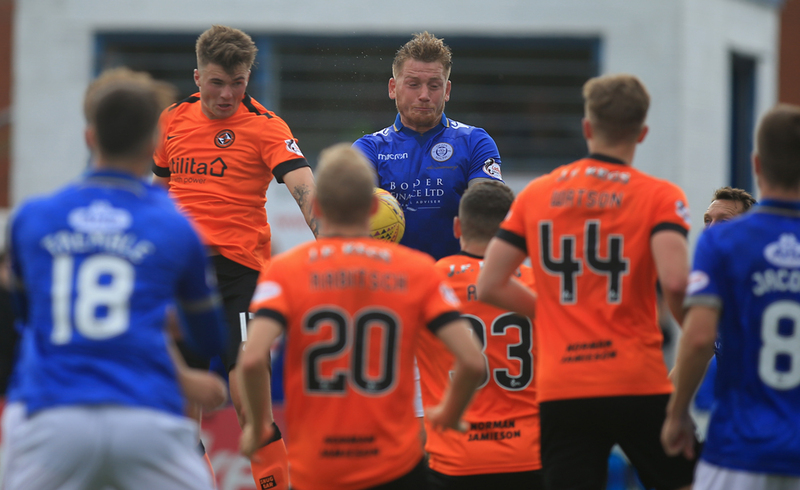 The best opening in the first ten minutes fell to Dundee United when a quick break led by Loemba ended with former Queens striker Clark nodding a back post header over the bar. The visitors were slowly starting to dominate the game, and the very impressive Loemba was at the heart of all their play and after linking with Clark a chance fell to new signing Safranko but his shot lacked the power to test Alan Martin. The goal that the visitors were threatening to score arrived after 15 minutes. Queens lost possession some 30-yards from goal and after collecting the ball, Stanton cut inside from the right and drilled a low shot past the dive of Martin to give his side the lead.Well and truly in control, the visitors continued to take the game to Queens and after carving through the home defence only a well timed last ditch challenge from Callum Semple prevented Safranko from having another attempt on goal. 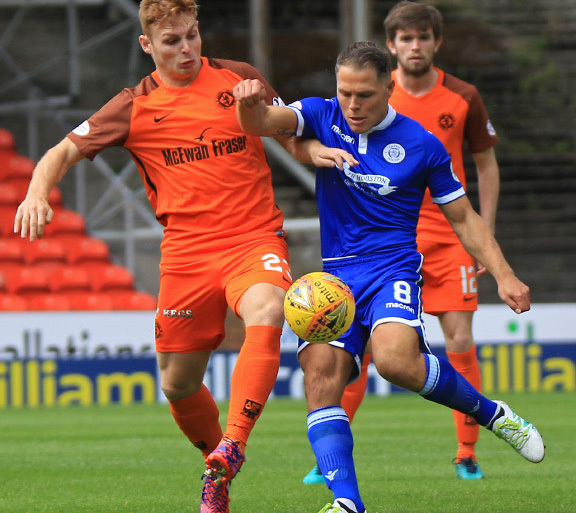 Queens responded with a quick counter attack and as Michael Doyle broke free with a run down the right, Stephen Dobbie`s pass found the defender`s run but he was unable to take the ball on the run and the opportunity passed. Minutes after that break, Queens fell further behind when the culmination of several passes set up a chance for Safranko, and from a tight angle on the left, the striker lifted the ball past the advancing Martin. A promising attack involving Stirling, and Gary Harkins worked an opening for Dobbie but his low drive was comfortably saved by Rakovan. Once again as at Cappielow last week Queens found themselves two goals down and although there was plenty of effort from the home team, there was no real threat in the final third of the pitch and chances created were very few and far between, and if anything it looked as though the away team could add to their total. They very nearly did score a third goal as once again Loemba created havoc down the left before finding Robson, but fortunately for Queens his low cross along the 6-yard box was just behind the onrushing United attackers. A foul by Harkins on Clark saw the first yellow card of the game, that incident probably summed up the first half for Queens as they quite clearly had not really offered much, and the half ended with Harkins dragging a shot wide from the right which although not a gilt edged chance, probably should have at least called the `keeper into action. The second half was much better from a Queens perspective and there was much more urgency about their play and right from the start they pushed the away side back and applied more pressure in the final third forcing the Dundee United back four to do more defending than they had done in the opening half. Just past the hour mark came Queens` best chance of reducing the deficit when they had three opportunities inside 30 seconds. Firstly Dobbie saw his drive from just inside the box parried out by the `keeper into the path of Harkins who in turn saw his effort blocked by the recovering `keeper, and as the ball ran loose to Lyndon Dykes his shot was again blocked by the dive of Rakovan. The United `keeper was worked more in those few seconds than he was in the entire first half, but just 5 minutes later he was beaten at last as Queens worked their way back into the game. 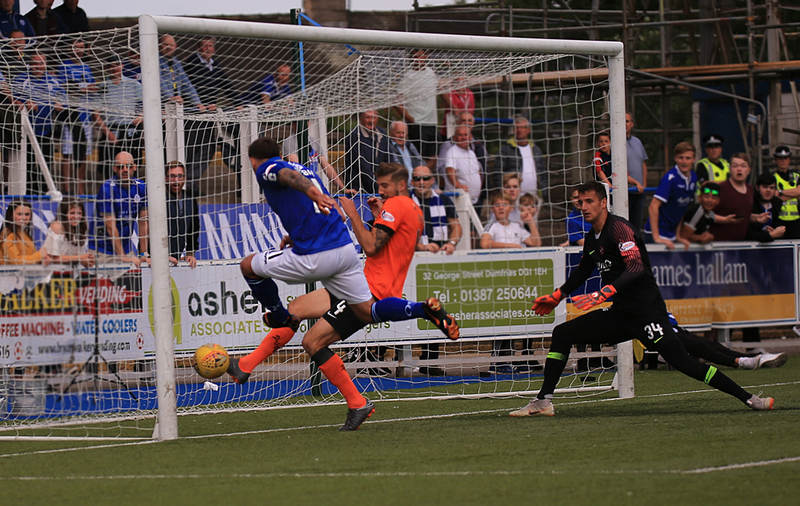 Kyle Jacobs broke clear down the right and his accurate delivery to the far post was met by a well timed run from Stephen Dobbie who was able to squeeze a half volley between `keeper and post to score his first league goal of the season. With their tails up, Queens were having their best spell of the game and after being awarded a free-kick for a foul by Barton on Dykes just left of centre some 20-yards out,but the chance was wasted when Harkins ballooned his effort well over the bar. Queens first change saw Connor Murray replace Josh Todd and almost his first involvement in the game saw United midfielder Rabitsch yellow carded for pulling the Queens man back. Although Loemba wasn`t as influential during the second half he was still a big threat and his excellent pace and trickery tied Doyle in knots who responded by sending him crashing to the ground which saw him become the second Queens player to be booked. Queens certainly had more possession in the second half, but apart from the goal and those three chances in quick succession, they didn`t test the `keeper enough although to be fair Dundee United looked much more organised than they did the last time they played at Palmerston in the last home game of last season. Youngster Declan Tremble was given the last 5 minutes as he replaced Andrew Stirling, but Queens could not find the goal that would have given them a share of the points. A 6 man melee right on time saw Rakovan, Robson and Dykes add to referee Kirkland`s paperwork when tempers flared after a round of pushing and shoving occurred, but that was to be the final action as seconds later, time was up. So Queens along with Falkirk, and Alloa remain without a win after the opening two games, and following next weekends Betfred Cup clash with St.Johnstone, our next league business will be at the Falkirk Stadium - early days yet, but it`s not the start we had hoped for. 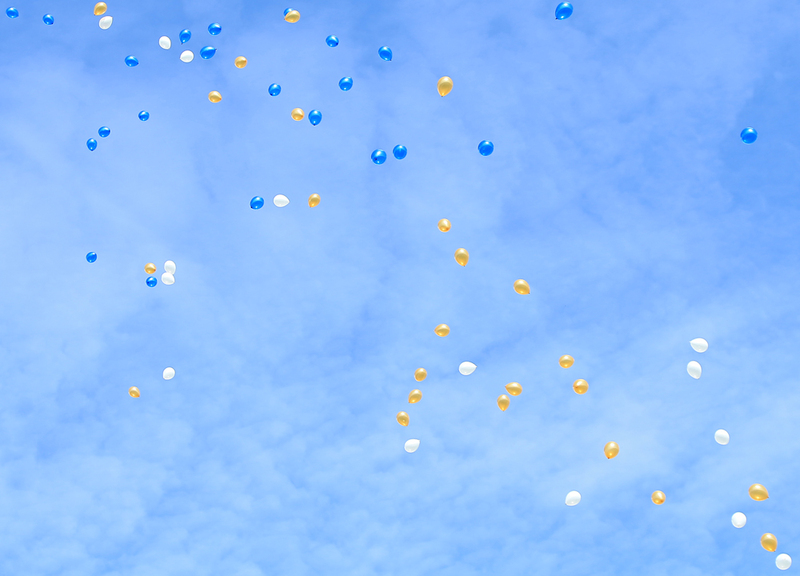 The match photo gallery can be found here.